Nicholas Dominic Dallessandro was born on October 3, 1913 at Reading, Pennsylvania. The short 5’ 6’ outfielder had tiny feet & one sports writer joked it took him 20 jumps to get out of the dugout. He earned the nickname “Dim Dom” making his debut with Boston in 1937 batting .231 in 68 games. 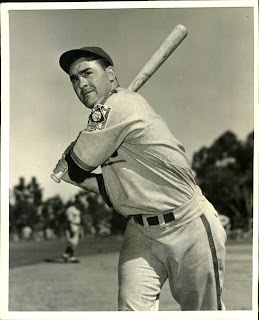 He went to the Pacific Coast League playing with San Diego until the Cubs bought his contract in 1939. He played in 107 games for the 1940 Cubs, batting .268 with a HR & 36 RBIs. The next season would be his career best batting .272 with 6 HRs, 85 RBIs (10th in the league) 36 doubles (4TH in the league) & the second best fielding percentage in the outfield at .987. He posted a .362 on base percentage drawing 68 walks as well. The next two years he played under 100 games both seasons batting a best .261 in 1942. 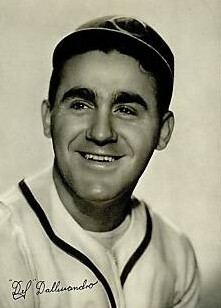 In 1944 he rebounded to play in 117 games batting .304 in 381 at bats, posting a .400 on base percentage (7th in the league) hitting 8 Hrs with 19 doubles with 61 walks & 74 RBIs. He had 9 assists & 2 double plays from the outfield posting a .980 fielding percentage. In 1945 he went off to World War II returning to play his last two seasons as a Chicago Cubs reserve outfielder. He spent the rest of his career in the Pacific Coast League until 1952. In an eight-season career, Dallessandro was a .267 hitter with 520 hits 22 HRs, 110 doubles, 23 triples & 303 RBIs in 746 games. He was a disciplined hitter posting a career .369 on-base percentage. Passing: Dom passed away in 1988 at Indianapolis at age 75.